After six starts of showing much potential, Frankincense broke through for his maiden victory at Bendigo yesterday afternoon in a style that shows there are plenty more wins in store for the NZ bred. The Makfi three-year-old was dominant in the 1400m win after pushing forward from a wide gate and settling outside the leader in running. Jockey James Winks, who has yet to miss a place in four rides on the gelding, was able to hold Frankincense together until the final furlong before putting the race to bed with a strong sprint. "He has been knocking on the door, and has been a bit unlucky in a few, but it was great to get him on the board as a winner today," Winks said. "It was a very strong win, I was impressed the way he put them to the sword and hopefully this gives him the confidence to go on with it." The was a first win for the Champions Thoroughbreds-Danny O'Brien combination after many close calls. 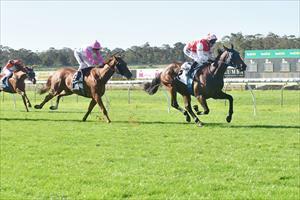 "It's great to get a winner for Jason (Abrahams) and his Champions team. They have been very loyal, and patient, and hopefully our luck has turned and this can open the flood gates," trainer Danny O'Brien said. "Frankincense and Slumberland both have loads of ability, but we were having a frustrating run of placings, so to see such a dominant win was pleasing."